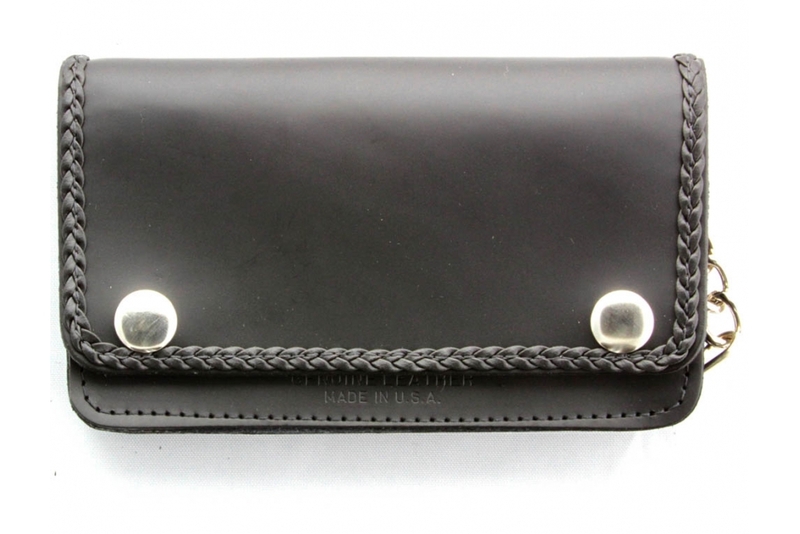 The black leather wallet is decorated with braided leather stitching around the front. The wallet features shiny snap buttons. Measuring size of the black wallet with chain when empty is 6x4x1. 2 separate bill folders can accept folded dollar bills. 2 credit card slots, 1 zipper pocket and a front driver license holder. You can fit more than just your credit card and cash in this wallet. 12 inch long metal chain with shiny snap button on belt hook. You can also hook the wallet chain to your belt loop. The quality leather wallet is made in the USA. 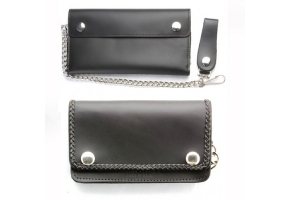 Typical biker wallet for those who ride motorcycles. The chain comes in handy just incase your wallet slips out of your back pocket.